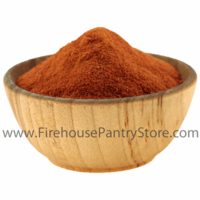 Tomato Powder is wonderful for adding color and flavor to pasta and bread dough. It can also be used in vegetable soup or stews for a richer stock with hint of tomato flavor. Stores and travels well - great for emergency food supplies, camping, boating, and RVing. Ingredients: tomato powder, silicon dioxide. Packaged in a facility that processes milk, soy, wheat, egg, peanuts, and tree nuts. We use this in our B.L.T. Dip Mix, New England Crab Dip Mix, Tomato Horseradish Dip Mix, and Garden Spinach Dip Mix.